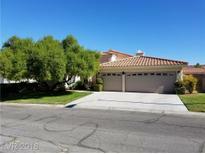 Below you can view all the homes for sale in the Belcourt Estates subdivision located in Henderson Nevada. Listings in Belcourt Estates are updated daily from data we receive from the Las Vegas multiple listing service. To learn more about any of these homes or to receive custom notifications when a new property is listed for sale in Belcourt Estates, give us a call at 702-323-5903. Great schools and shopping close by! MLS#2081535. Acclaim Real Estate. Renovated open kitchen concept,Granite counter tops - Travertine back splash, newer Stainless Steel appliances, double oven,5 burner cooktop* Beautiful hardwood flooring* Avalon shutters throughout* Ceiling fans*Master bath with 2 way firepl., Quartzsite counters, custom shower, separate garden tub* Fabulous private backyard setting, large 12'x20' covered patio, nice solar heated pool-just re-plastered* A must see! MLS#2069914. Ceci Realty. Solar Electric to save on energy bills. Info Available. MLS#2045082. Synergy Sothebys Int'l Realty.